After drilling the field goal, Vikings' tight end Rhett Ellison was flagged for a flagrant face mask, pushing the team back to the 36-yard line (a 54-yard field goal, which converts just under 60%). On 3rd-and-25, the Vikings pounded the ball where Adrian Peterson lost 3-yards, making it a 57-yard field goal attempt (~50% conversion). At 50% (and possibly higher as Blair Walsh had previously made 12 of 13 kicks over 50-yards), the field goal is still the right fourth-down decision. Walsh missed the field goal and overtime continued. I give credit to Leslie Frazier for making an attempt to get closer on third down and you cannot fault him for putting the ball in his best player's hands. In general, on the long distance-to-go, a screen, short pass, or delay is probably the more efficient option than just running up the gut. Frazier took a conservative approach, not wanting to ruin his current field position, rather than making a legitimate effort to get closer to the end zone. Let's look at field goal conversion rates by distance to show why closer is always better. 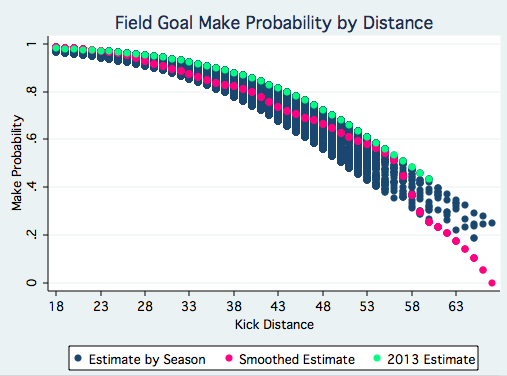 In the blue, we see estimates for field goal conversion based on the season and distance. The green highlights estimates for 2013 (kicking has improved significantly since 2000). In pink, we see a smoothed estimate not-adjusted for season and includes data from 2000 through last week. After the missed field goal, the Bears converted a few first downs until attempting a field goal on 2nd-and-7 from the 29-yard line (a 47-yard attempt). Again, Robbie Gould is an extremely reliable kicker, but a 47-yard field goal misses 25% of the time (1 out of 4 attempts). Gaining just four yards decreases that miss probability to 1 out of 5 attempts. Why not make an effort to get closer? The theory is that if there is a bobbled hold or a bad snap, that will give the offense another opportunity to attempt the kick. I tried to estimate a figure for percentage of bad snaps or holds, and if it is less than the percent increase you gain from getting closer, that theory does not make sense due to opportunity cost. I found around 50 plays with aborted snaps or holds on field goal attempts since 2000, which would put the botch probability at around 0.3-0.4%. One yard means close to an additional 2% chance of making a field goal on a 47-yard attempt - significantly higher than the bad snap rate. Bad snaps or holds are not specifically noted in the play-by-play, though, and they are difficult to tease out, so that estimate will not be perfect. It is just meant to give a general idea of the likelihood of the event. Gould's kick squeaks just wide of the post and the game continues with the Vikings getting the ball back; this time they made sure to get closer. The Vikings did not stop at the Bears 42 or the 31 or the 27. They drove down to the 16 before attempting a 34-yard field goal with just under 2 minutes remaining in overtime. A 34-yard field goal converts around 92%, again leaving an 8% (although probably less with Blair Walsh kicking) chance that the Bears would get another chance to win the game - so you're telling me there's a chance! Neither team had a timeout remaining, and the Vikings had a 1st-and-10 from the 16-yard line. The Vikings foolishly risked losing the game when they did not have to. Why not kneel down and run the clock down to guarantee a tie at the very worst? Or better, keep rushing to run the clock out while being mindful of fumbling. Walsh nailed the field goal, sealing the game for the Vikings. Eight percent is very low, but it is still a possibility. Just ask Alabama how those low probability events turn out. Keith, great topic to post about. Unfortunately, I didn't get to watch the end of the game. Its not clear in your post what happened after the Vikings missed. Did the Bears and Vikings both miss? How did the Bears lose? Thanks! Great post and I completely agree that NFL coaches have a field goal range fallacy, but wouldn't rushing for more yards create the opportunity for a fumble, or is that insignificant or preventable? Great article. This one really frustrated me. I didn't even think of the fact that the Vikings should have run extra time off the clock at the end. Good point. The (almost) identical situation appeared in the Patriots-Broncos game last week -- 1st down inside the 20 with over 2 minutes in OT. Belichick chose two kneel-downs (consuming almost a minute) before kicking the winning goal. Reading this shows me why this was a very good decision, and shows (once again) that Belichick understands something that seems obvious to us (but not to many NFL coaches and commentators): 95% is not 100%. Even worse for the Bears was that a tie was basically as good as a win since they have already lost all the relevant playoff tiebreakers. No need to gamble for a long field goal, especially on third down. Going into Sunday, Robbie Gould was a career 87% kicker from 40-49 yarss. He missed two indoors from that distance his entire career. He had missed only one TOTAL field goal indoors since 2008. To say "Gould is good but the stats say he only had a 75% chance to make that kick" is disingenuous. 87% kicker from 40-49 yards *indoors. * Sorry about that. A couple of comments are needed before denigrating Trestman for his choice to pursue a field goal. It is not just the bobbled snap that matters. It is potentially losing the football with a fumble and if you are to play it safe by calling a conservatitve "no fumble" play, you might just as easily lose yards or get a penalty which would make the field goal more difficult. Don't ask what are the odds of a fumble, ask what are the odds of a fumble or losing yards or getting a penalty and compare that to the advantage you may get for running another play or two. You can't just assume another play or two would get you that four yards. The Vikings tried to eek out a couple more yards before kicking their field goal and the great Adrian Peterson LOST 3 yards. Gould simply doesn't miss indoors from that range and I doubt you could find an advantage either way with accurate analysis. this pretty much misses the point on why to kick early. Teams fumble at about 1%, and throw ints at ~3% of the time. add in the fact that the defenses will be going for the fumble in a "certain loss" situation, and that would be much larger than the 'bad snap' scenario. (note: you'd still add the bad snap result to that). also add in that the team basically knows you are going to run it, so like the vikings, that run could lose you yards. With all that in mind, it seems much more a even tradeoff than presented here, and in fact seems to reverse the conclusion.